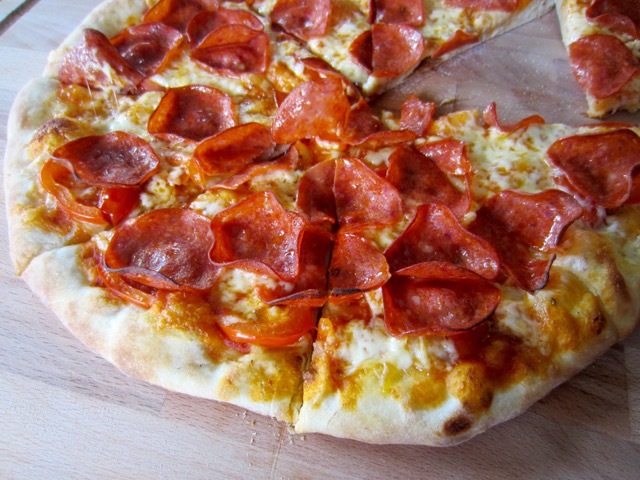 I made this pizza dough over the weekend and we thoroughly enjoyed eating a freshly baked pepperoni pizza. You need to plan in advance because it should rest for 8-12 hours. I had left over dough which I wrapped in a cling film, then wrapped in foil and put in the freezer. Thaw frozen dough in fridge then bring to room temperature before use. It’s a bright, sunny day so life is good!!! Left: The dough after eight hours and Right: the dough after adding salt, sugar and olive oil. Left: The dough after twelve hours and Right: the dough after adding salt, sugar and olive oil. Stage 1- calculating the temperature: Put the flour into a bowl and take the temperature of the flour in centigrade (mine was 22ºC). Take the room temperature in centigrade (mine was 23ºC) and total the two figures (total = 45ºC). Minus the total from base temperature of 64ºC (64-45 = 19ºC). This is the temperature for the water you’ll use. Now you can convert into Fahrenheit if you want (=66ºF). Stage 1- mixing the dough: Mix the flour with the yeast in a bowl and make a well in the centre. Add the water to the well and using your fingertips gradually mix in the flour and continue mixing until the dough comes together and is homogenous. (The dough will be firm and a little sticky). Cover the bowl with a with plastic wrap and let rise in a warm place at (20-24ºC /68-75ºF) for 8 to 12 hours. Stage 2 mixing the rest of ingredients: Knock back the dough and place it in a stand mixer, with the dough hook at low speed. Add the salt, sugar and olive oil a little at a time, until fully incorporated (it will look like some slashy mess). Now add the flour in 4-5 batches and continue mixing until it comes together. Knead for 5-10 minutes or until the dough is elastic. Form the dough into a ball and cover with plastic wrap at room temperature for 1 hour. The dough is now ready to use. Mine weighed 914g (2Ib) and this can make 4 x 12 inch pizzas. Stage 2 rolling the dough. The dough makes a perfectly light base for any pizza. You’ll need about 225g dough for a 12 inch pizza so you can make 4 x 12 inch pizzas from this dough. 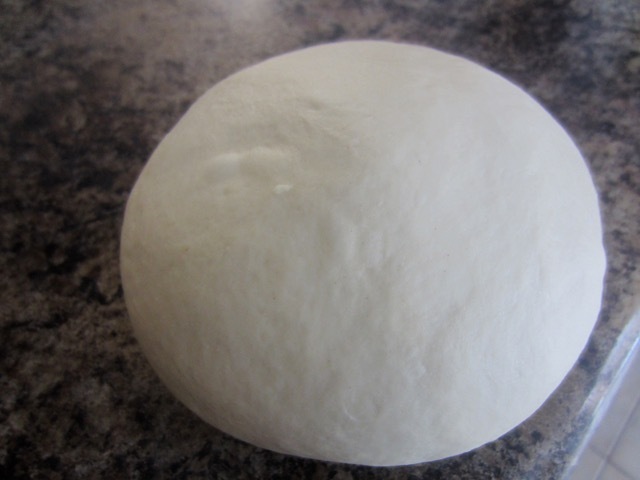 Rolling the dough: on a lightly floured surface, roll out the dough thinly to the size suggested in your recipe. Lightly flour the dough and roll on the pin and transfer to a baking tray or pizza stone. If the dough shrinks, dip your fingertips in flour and push the dough back to its original size. Wow Liz, this looks amazing! I wish I could have a slice right now! Did you have a slice?